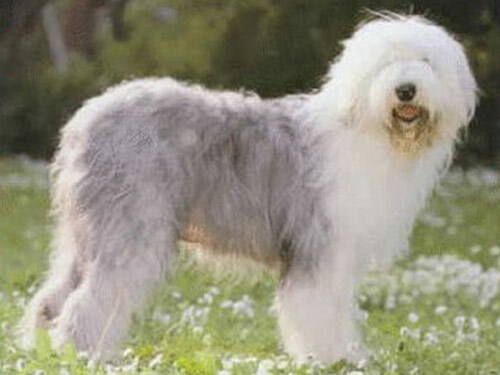 Large and squarely proportioned, the Bobtail is an agile dog with a profusely shaggy coat and stocky body. They are muscular and well balanced even though they appear compact. Bobtails are symmetrical and thickset with able bodies and an intelligent expression. The sum of these qualities make Bobtails an ideal breed when it comes to handling the tasks required of shepherd or drover dogs. Bobtails are often thought of as giant, lovable teddy bears and with good reason. They are friendly and faithful dogs who play well with children, even though they may try to herd them by bumping them (not nipping). They enjoy being part of the family, are gentle and protective and have strong natural herding instincts. Bobtails make good family pets and companions who often want to play and stay close to home. At times they crave their own space and can act like couch potatoes. They are intelligent dogs who work hard and love a good run. They’ve been known to stay “young” and very active for years then suddenly turn old. While herding, they will try to anticipate commands and take the initiative to think, and act, on their own. They are talented in the areas of retrieving, herding and acting as a watch dog. In past generations, the breed was thought to be fierce and untrustworthy however these characteristics have long since disappeared. Bobtails are even-tempered and adaptable to a variety of environments. They make exceptional herding dogs and, because they can tolerate cold weather well, they have been used to herd reindeer as well. Bobtails have a long, coarse double coat featuring a soft downy undercoat covered by coarse guard hair. To keep their coats in top condition, they should constantly be cared for to prevent the coats from becoming matted. Be sure to brush and comb through to the dense, waterproof undercoat at least three times per week so the dog does not develop skin problems or become plagued by parasites. Carefully clip out tangles without nipping the skin of the Bobtail. If the dog is not being shown, the coat can be professionally machine-clipped every two months or so, about one inch all the way around. This breed is a seasonally heavy shedder, usually in the spring (April -May). Bobtails are prone to hip dysplasia, cataracts and IMHA (Immune Mediated Hemolytic Anemia). These dogs were developed for hard work and love a good run. They need to be taken on a daily walk, jog or run. While walking the dog, make the Bobtail heel beside or behind the person holding the lead, as in a dog's mind the leader leads the way. This will ensure that the human is the rightful leader. Bobtails can become strong-willed if owners are meek, passive or do not make the house rules clear in a way the dog can understand. They need firm obedience training that comes in a firm yet calm and confident manner. Always show consistent leadership when training this breed.